Zhaire Smith (left) and Landry Shamet are looking forward to the start of the NBA summer league. In a 48-hour span, the Eastern Conference went from looking as if it could finally compete with the West to being dwarfed by the powerhouses that are the NBA's elite teams. The biggest moves of this young free-agent period, of course, have been LeBron James agreeing to a deal with the Lakers on Sunday and Golden State answering Monday by making DeMarcus Cousins a Warrior with a one-year, $5.3 million deal. The Cousins move sent shock waves through the NBA, with players, fans, and pundits weighing in throughout the night. 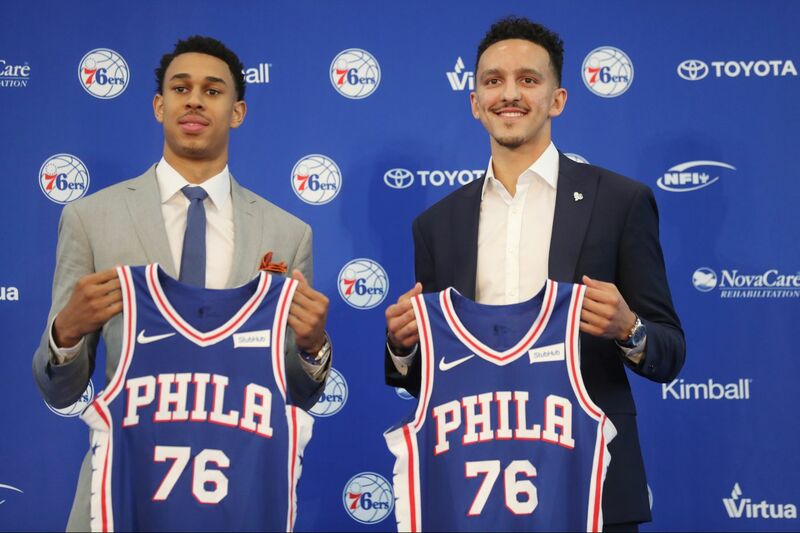 But with the 76ers, first-round draft picks Zhaire Smith and Landry Shamet have focused their energy elsewhere. "I didn't have too much of a reaction — just 'wow, that's crazy'," Smith said after summer-league practice Tuesday in Camden. "The West is crazy now." It's not that they don't care about the power dynamics of the NBA, or where the best players are choosing to sign, but they care more about establishing themselves. "I have a lot more on my plate. I'm at that level now. I'm in the NBA," Shamet said. "You hear about it, your friends talk to you about it, you see Twitter, but I'm not taking any more of a vested interest in it." Landry Shamet, center, passes during a summer-league practice. It would be different if the Sixers made one of the big free-agent splashes, as it would directly affect what Smith and Shamet should expect in their rookie season. But that's not the case, so all their focus has to be on what is next. "The hard part starts now," Smith said. Smith and Shamet would probably have more to say and different reactions to free-agent news if they were still in college, or if summer league wasn't right around the corner. "I just focus on myself," Smith said. "You see it all over social media, you look at it, scroll past it, and don't get too deep involved in it." The Sixers' final summer-league practice will be Wednesday, after which the team will head to Las Vegas. It'll be the first opportunity for Smith and Shamet to showcase their talent at an NBA level, around NBA coaches, within an NBA system. Zhaire Smith defends during summer league practice. Smith, taken 16th in the June 21 draft, is making adjustments from playing as a forward at Texas Tech to being more of a shooting guard in the NBA. Summer league will provide him competitive time in his new position. "I just can't wait to play five on five. It's been a while," Smith said. Shamet, the 26th pick, wants to soak up as much knowledge as he can during summer league, which runs in Las Vegas from July 6-17. It's a small window of time for the two rookies to learn Sixers schemes and terminology before training camp in September. "First and foremost, I want to win," Shamet said of his summer goals. "Personal goals are I want to learn the system and start carving out a niche early and figure out how I'm going to contribute in the NBA." So, while King James is being anointed in Los Angeles, and the Warriors continue to collect all-stars, the Sixers rookies are just looking to get a win under their belts and prove they belong.